Hi guys, just finished watching White House Down at TGV One Utama earlier tonight. The TGV cinema was refurbished with dim lights, a Beanieplex hall, and LUXE hall to booth. Thanks to KL Timeout (yes, you have to pay Rm6.90 for the magazine), I managed to secure the tickets for the movie. We arrived close to 8pm, and there were long lines of people already waiting. Our queuing line, with those from Expatriate Lifestyle was short (of course, since ours came from a paid). Compared to the others like eCentral, Spotlite, they had a queue which could take up to 45 mins to clear. As it was a premiere screening, all our electronic devices had to be given to the staff manning the place and kept away until the screening ended. Even my so called analogue Nokia which is almost like a 3310 in every way except for a colour screen and MP3 function was not spared either. Our electronic devices were kept in transparent bags, and we were given a tag with individual codes to keep. All customers will be scanned using an electronic scanner at the entrance, so you cant run away from doing the same! My original driver was away sick, so I had to enlist Asta L, to come with me. Fortunately she was not working tonight, so she could come. 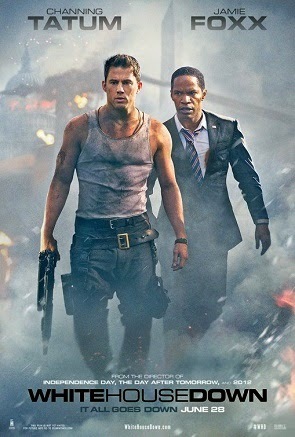 This much action packed movie starring Jamie Foxx as president of United States (paying homage to President Obama, I am guessing), and Channing Tatum, as an aspiring divorced father who is looking for a job with the Secret Service. The White House is down when a number of trained renegade soldiers masquerading as maintenance and domestic staff infiltrate the White House, capturing it. The plot is predictable with the aspiring father single handedly fighting off the bad guys, with his daughter, Emily being caught in the middle of the action, and finally the dad saves the day, and everyone goes home happy and smilling. Overall it is a good to watch movie for those 131 minutes to take you away from reality, with lots of action, expensive explosive blasts, and chair gripping action. Good to watch once, but not twice. I have laundry to do.